A brand new event for 2020 and an early release to celebrate the new website launch. This event is all about the ubiquitous but also very welcome knitted hat. I will design 3 new hats. One will be a traditional fitted hat of the beanie or folded back ribbed brim persuasion. One will be an ear-flap hat. One will be a tam-o-shanta, with a Fairisle element. Two of these will also be sized for adult women and men, the tam will be for a woman; and I will possibly add 2 child sizes. The skills will range from very easy to moderate, at most. 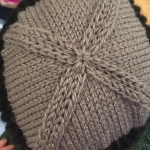 You will also be able to choose from any hat design that is on my website at the time of the event and I will email you the PDF after the event if you buy the yarn on the day. Knitting in the round via Magic Loop, on one short circular needle or on DPNs. Transitioning between these different methods. The construction of three very different types of hat. How to adapt the patterns. I plan to use a mix of DK, Aran and chunky yarns. Hats usually take a maximum of 2 balls of yarn, often just one, and a week to knit at most.